“In the U.S. and Canada, people are driven to accumulate things, to work all their lives, to hold on and amass more and more, to own their house before they die. And for what?” says Cheryl Lafond. “All I wanted was a way to live a simple life, to be happy, and enjoy my surroundings,”. The Canada native was in her early 40s when she lost her job as a safety officer in the oil and gas industry. Although was wasn’t near retirement age, she didn’t feel like scrounging for a job along with everyone else during such a bad economy in her hometown of Calgary. So instead, she decided to retire early…to Nicaragua. Cheryl now lives in a one-bedroom, one-bathroom apartment in the beach town of San Juan del Sur, and she feels right at home. She especially likes her rooftop patio for relaxing and she’s only three blocks from the beach. For $400, plus electricity, she has everything she wants here. In Canada, Cheryl’s mortgage alone was $2,000 per month, which was cost-prohibitive without a job. Her total cost of living each month was coming to $4,000. 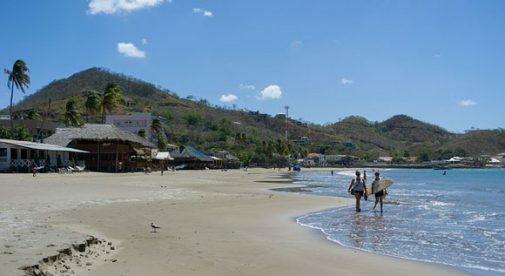 In San Juan del Sur, Cheryl can live off her savings and she generally spends around $1,000 a month. Cheryl has made lots of friends in San Juan del Sur and she enjoys meeting them for drinks and meals. And with over 60 restaurants in town, she has plenty of choices. But her favorite way to spend time with friends is lounging at the beach, where they can get fish carpaccio, chicken wings, or a veggie wrap each for $1 and a beer or rum drink for the same. And the killer sunsets are free. Cheryl is loving her life by the beach in Nicaragua. “For me, I couldn’t have found a better place to retire so young,” she says. “Everything is so simple here. I do what I want. No one bothers me. I wear shorts or summer dresses and flip flops all the time.